Show your lawn’s true stripes with this fresh mowing technique. Ever wondered how those striking stripes wound up on the turf of your favorite ballpark or golf course? They aren’t the work of lawn paint or an exotic grass species but, rather, a mowing technique called lawn striping. Blades of grass are bent in opposite directions using a lawn roller attached to a mower. As the grass reflects the sunlight, those sections of blades bending toward you look dark green while those bending away look light green. Next to one another, they produce a visual effect of alternating light and dark stripes that can be quite sharp. But lawn striping isn’t simply for the big leagues. It can improve your property’s curb appeal and even benefit your own lawn’s health—provided you learn the ins and outs of the technique first. Read on for key considerations before striping your lawn. Lawn striping requires a simple add-on to your mower. To apply the weight necessary to bend grass and achieve the alternating light-dark effect, you’ll need a lawn roller—a heavy, cylindrical-shaped metal or plastic garden tool. The most convenient lawn rollers attach to the rear of your lawn mower, namely tow-behind rollers (starting at $148 from brands like Agri-Fab on Amazon) and lawn striping kits including a lawn roller and mounting hardware (starting at $93 from brands like Lawn Stryper on Amazon). Be sure to get a roller or a striping kit labeled as compatible with your mower size. In addition, the drum of the roller may need to be filled with water or sand before attachment, depending on the model. Lawn striping affords lots of looks. You can stripe your lawn in a variety of patterns, such as stripes, a checkerboard, or diagonally. • For a basic stripe pattern going either north-south or east-west, start by mowing a border around the lawn perimeter. Then, working from any side of the lawn, mow the full length of the lawn in a single direction and in a straight line parallel to the lawn edge. When you reach the other end of the lawn, lift the mower deck just to turn the mower around to face the opposite direction, and mow a new stripe adjacent to the previous one. Repeat until you have striped the full lawn. • For a checkerboard effect, first create a basic stripe pattern as above. Then, mow the same pattern again, this time perpendicular to the stripes (e.g. mow east-west if the existing stripes run north-south). 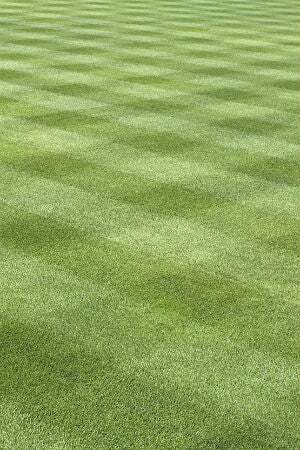 • For a diagonal pattern, create the stripe pattern, but instead of mowing parallel to the lawn edge, mow diagonally from the edge. Lawn striping promotes healthy grass growth. Mowing your lawn in a single direction creates grooves, ruts (track marks), holes, or low-growth spots that lead to a mottled and uneven lawn. On uneven lawns, taller grass blades bend over shorter blades like a canopy, blocking their access to the sun until they eventually die. 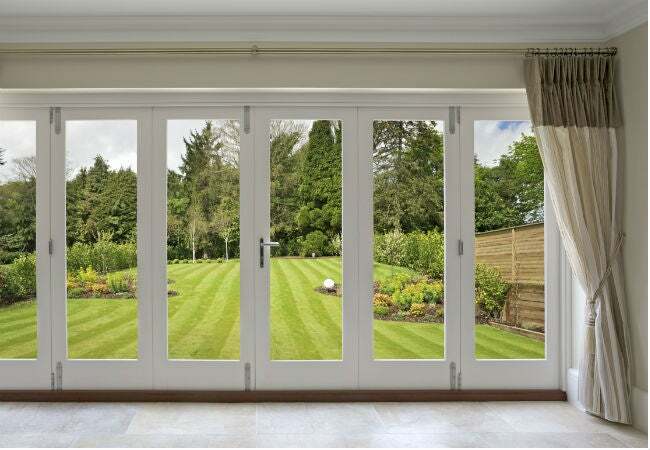 On the flip side, mowing the lawn in two directions for a striped effect prevents lawn deformities and low spots, affording a pristine and uniform lawn in which all grass blades get equal access to the sun, and all thrive. Lawn striping loses intensity if you cut the grass too short. The taller the grass, the more readily it bends under the weight of the roller. This leads to more blade surface reflecting sunlight and, naturally, a more pronounced lawn striping effect. 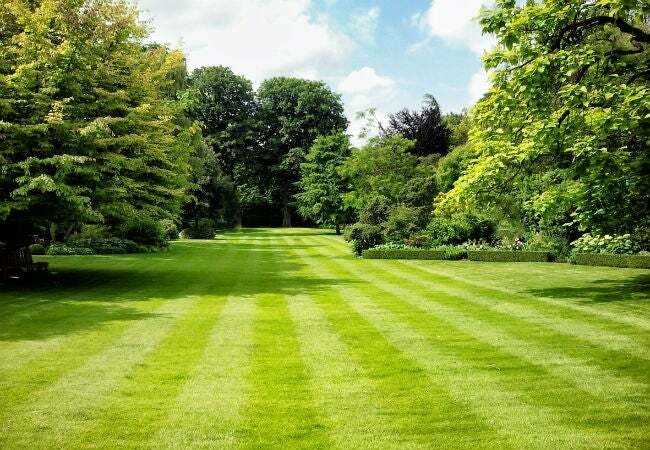 Lawn stripes look the most intense when the grass height is between 2.5 and 4 inches, so avoid cutting grass much shorter than that—short grass doesn’t bend much and, therefore, won’t reflect light well enough to create the effect of crisp stripes. Lawn striping shouldn’t be repeated in the same pattern every mowing session. 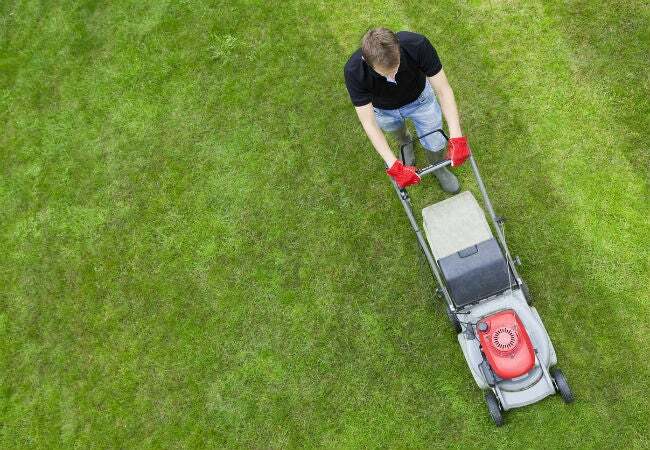 Mow as often as is needed to maintain that 2.5- to 4-inch grass height, which could be anywhere from every one to two weeks during summer to every two to five weeks from fall through winter. However, you don’t want to re-stripe your lawn in the same pattern and direction more than every two weeks—doing so can result in grass that permanently lies flat. For best results, alternate the pattern after every two-week period. For example, if you mowed north-south stripes last mowing session, mow east-west or diagonally this time. Lawn striping isn’t suitable for all types of grass species. Cold-season grasses (e.g. Tall and Fine Fescues)—those which flourish in early spring and early fall at temperatures ranging from 65 to 80 degrees Fahrenheit—are the best candidates for striping. Their longer, more flexible blades bend easily under the pressure of the lawn roller. Warm-season grasses (e.g. Bermuda, St. Augustine), on the other hand, have shorter, more rigid blades that don’t readily bend. Even if you manage to stripe grasses in regions with midsummer temperatures ranging between 75 to 90 degrees Fahrenheit, those blades are more likely to spring back, so don’t expect them hold their stripes as well.